The above work, "Habitable Moon of Ringed Exoplanet", is by the renowned astronomical artist, Adolf Schaller. Please visit www.omnicosm.com to see more of his works. Farr Intellectual Property is a law firm focusing on intellectual property – the law of confidential information, copyright, designs, domain names, patents and trade marks, their protection and their commercialisation. Our principal, Malcolm Farr DipLaw (SAB), BSc LLM (Syd) LLM (UTS), has been in practice as a solicitor since 1985, initially gaining broad experience both in private practice and as in-house counsel, and has concentrated on intellectual property since 1996. Malcolm’s experience includes advice work over all areas of intellectual property, negotiation and preparation of commercialisation documentation, trade mark and design application prosecution, and litigation and contested matters in relation to patents, domain names and trade marks. While we are based in Perth, we advise clients from all across Australia and overseas. Our aim is, and always shall be, to provide our clients with quality professional advice and representation in a timely manner. 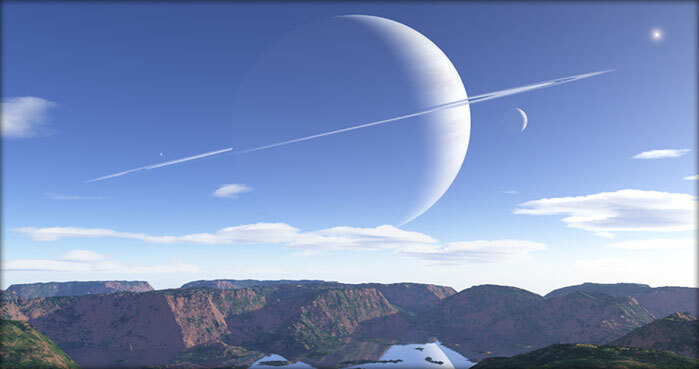 "Habitable Moon of Ringed Exoplanet" © 1999, Adolf Schaller, used under licence from the artist. | Text © 2012, Malcolm Farr trading as Farr Intellectual Property, ABN 38 505 172 668 | Please note that nothing on this website is given by way of legal advice. For legal advice on your intellectual property issues, please contact us by way of the details or fillable form set out on the Contacts page. | Website created by Genie Media, 2012.